Market Walk is home to the largest car park in Chorley, you’ll find the flat iron car park off Union Street and the famous Flat Iron Market. Market Walk has excellent parking facilities with several large town centre car parks right on its doorstep. The most conveniently located Short Stay shoppers car parks are The Flat Iron car park with 181 spaces (post redevelopment), Portland Street with 101 spaces and Hollinshead Street with 75 spaces and all are operated on a pay and display system. For a Long Stay car park Friday Street has 163 spaces and is just a short walk away. Parking is free after 1pm on Saturdays and free all day on Sundays and bank holidays (NB- a Time of Arrival ticket is required to be displayed when parking on the Flat Iron car park between 8am and 5pm on each day of the week – even in free periods). You can also pay by phone on all of our car parks by downloading the Mi-Permit app, available in both Google and Apple App Stores. 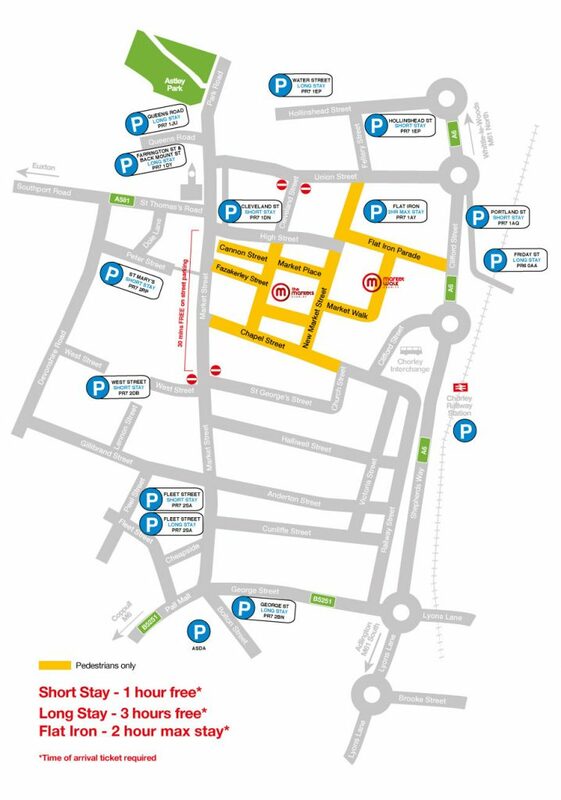 There are numerous car parking spaces available in Chorley town centre with over 1,100 spaces available across 12 car parks.